The government requires an additional US$4.5 million this year to effectively carry out unexploded ordnance (UXO) operations including mine surveys and clearance along with risk education and victim assistance. State-run Electricity Generating Authority of Thailand (Egat) has signed two renewal power purchase agreements (PPAs) with Electric de Laos (EDL) to buy power from two hydroelectric plants: Nam Ngum 1 and Say-sed dams. Authorities have ordered the closure of three Chinese clinics this month in the northern Laotian province of Luang Namtha after issues such as unsanitary conditions and unqualified doctors have led to multiple patient deaths, RFA’s Lao Service has learned. Vietnam and Laos will further strengthen their cooperation in training Lao military officers and learners at academies and schools under the Vietnamese Ministry of Defence, while supporting each other in communicating the traditional friendly relations, special solidarity and comprehensive cooperation between the two Parties, States and armies. PFM stands for Public Financial Management. It relates to the way governments manage public funds and the impacts on the growth of the economy and the wellbeing of citizens. A team of Ladner Rotarians, including a couple from North Delta, has recently returned from delivering water filters and education supplies to remote villages in Laos as a part of the club’s Adopt-A-Village initiative. The Prime Minister’s Office last week issued an announcement entrusting the Ministry of Foreign Affairs in collaboration with the Ministry of Health and other sectors concerned to organise a seminar to discuss and study the medical use of marijuana. The United Nations Development Programme (UNDP) in Laos has helped farmers improve their rainwater management infrastructure that helps to prepare the region for changing weather patterns associated with climate change and which secures the agricultural sector in Xayaboury province. Local labour authorities will continue to inspect factories as part of efforts to protect the rights and benefits of all members of the national workforce. Representatives from line departments of the Ministry of Health met with development partners in Vientiane on Monday as part of a committee to review the quality assurance structures and measures that underpin the health care system in Laos. THE organisers of Thaifex-World Food of Asia 2019, a Thai food exhibition, are looking for business opportunities with Lao firms in the food and beverage sector, so they can expand their markets in Thailand and overseas. Helping farmers in their efforts to adjust to climate change in Laos’ Xayaboury Province alongside Lao government partners, The United Nations Development Programme (UNDP) was active back in 2015. Deputy Prime Minister Vuong Dinh Hue shared Vietnam’s experience in developing cooperatives with a delegation of the Lao National Economic Research Institute in Hanoi on March 19. Li Zhanshu, chairman of the Standing Committee of the National People’s Congress (NPC), on Tuesday met with Xaysomphone Phomvihane, president of the Lao Front for National Construction. Some 174 employees of Phu Bia Mining Company will benefit from a certification assessment programme to improve their knowledge through government diplomas or certification after many years with the firm. Individuals or organisations advertising tobacco products will be fined and punished under a Prime Ministerial decree on the regulation and control of the addictive weed. First offenders will be fined 20 million kip. If breaching the rules a second time a fine of 40 million kip will be issued. The Embassy of Malaysia in Vientiane, Lao PDR has encouraged Lao government officials to apply for fully sponsored short term training courses under the Malaysian Technical Cooperation Programme or MTCP. The two provinces’ tourism authorities last week announced the Quan Son – Vieng Xai tour. In northern Laos, the majority of tea produced is exported illegally to China, significantly reducing the share that actually benefits the population. 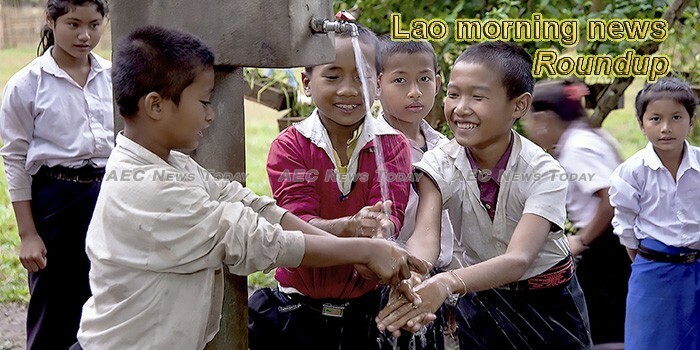 This week’s Lao morning news feature photo acknowledges World Water Day, March 22.